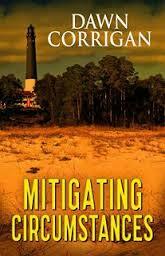 I’ve had the good fortune to read an advance copy of my friend Dawn Corrigan’s debut novel “Mitigating Circumstances,” to be released in January 2014 via Five Star. Part mystery-part adventure and also humorous travelog of the Florida Panhandle, the novel opens with an engaging scene. The facts and action keep coming. We get to know Gale LaRue pretty quickly and like her as narrator. She’s observant, sardonic, and doesn’t waste words. She’s got the right mix of personal ingredients, locale, and interesting friends and family that have us already imagining a series. A skilled fiction writer knows how to use details and make characters particular, and Corrigan gives us that. The profiles of the municipal workers in the home office are spot-on and memorable. We know Karen from her Tevas sandals and the fact that she’d rather take time to eat than try to escape. We can recognize the deep-thinking dude in the office who suggests putting out signs to stop the proliferation of signs. Em’s secret cigarette and call for denial tells us things. All the details paint the canvas: the Whataburger references, the drawling good old boys we can see and hear, the spicy adds Gale makes about underwear and “the girls,” and – terrific stuff – Em and Gale’s use of the names of poets and B-film starlets as replacements for more profane exclamations (e.g., “John Greenleaf Whittier!” or “Sara Michelle Gellar!” instead of “Jesus H. Christ!”). There are lots of references to food as a leveling force. Just as Travis McGee likes his one-inch of Boodles gin on ice, so does Gale LaRue savor her Cukoo Juice smoothies. Corrigan pushes her story forward in an efficient and suspenseful way. In intervening chapters, the narration switches to third person in order to carry scenes necessary to the plot. It’s a technical balancing act for most writers, yet Corrigan makes the shift in POV almost imperceptible. What I like most about “Mitigating Circumstances” is the writing itself. The author’s command of the language is original and crisp. And Gale Larue’s delivery is funny. It’s impressive that Dawn Corrigan can write a debut novel that’s refreshingly free of the self-conscious and cloying prose style we identify as coming from workshop schools. She adheres to Elmore Leonard’s Ten Rules of Writing and leaves out the self-conscious parts that “sound like writing.” Corrigan writes directly and with spirit, take it or leave it. Posted in booknotes and tagged Dawn Corrigan novel review on December 13, 2013 by Wm P.